To meet the eye care needs of the Armenian people the EyeCare Project has embarked on its biggest project ever – “Five for Five” – and we need your help to bring accessible, quality eye care to all of the people of Armenia. At the request of the Minister of Health, the EyeCare Project will take the lead, in partnership with the Armenian Health Ministry and the Malayan Eye Hospital, to build five Regional Eye Clinics throughout Armenia. The cost of the project is approximately five million over a period of five years. For 23 years, the EyeCare Project has been working to achieve their mission and bring hope and sight to Armenian eyes. What began as a medical mission to Armenia to aid war and earthquake victims has evolved into a comprehensive, integrated program to eliminate preventable blindness and to make modern eye care available to adults and children in Armenia. In 2003, the Project implemented its Initiative, “Bringing Sight to Armenian Eyes,” a five-point program focusing on direct patient care, medical education, public education, research and capacity building. The program serving all Armenians—targeting the vulnerable and treating them at no cost—has seen 300,000 patients, performed 15,000 surgical procedures and given away 50,000 pairs of new eyeglasses since 2003. The EyeCare Project’s mission is to provide access to eye care for all Armenians and to eliminate preventable blindness. To accomplish their mission they have established seven sub-specialty clinics in Yerevan — each directed by an Armenian fellow who trained in the United States — and introduced eye care throughout the regions with a Mobile Eye Hospital, providing examinations and surgery for more than 500,000 Armenians. Because the Mobile Eye Hospital can visit towns and villages only once every two years, the AECP has launched its biggest capital funding campaign ever — Five-for-Five — to develop Five Regional Eye Clinics throughout Armenia in five years for $5 million, $1 million each. The clinics will provide access to eye care for all Armenians, all of the time, in Ijevan, Gyumri, Vanadzor, Kapan and Yeghegnadzor. Access to eye care in Armenia is extremely limited ¾ especially for the poor. Just a handful of towns provide basic surgery and none advanced surgery or specialized eye care, available only in Yerevan. And most Armenians cannot afford surgery or travel to the capital. The Regional Eye Clinics will enable Armenians to access care for all of their needs including emergency trauma and serious eye disease rather than having to wait two years for the Mobile Eye Hospital to visit their town. The AECP Mobile Eye Hospital has provided eye care for hundreds of thousands over the past 12 years, yet the accessibility and affordability of eye care in Armenia continues to be extremely limited and disproportionately affects the poor and those living in remote regions. 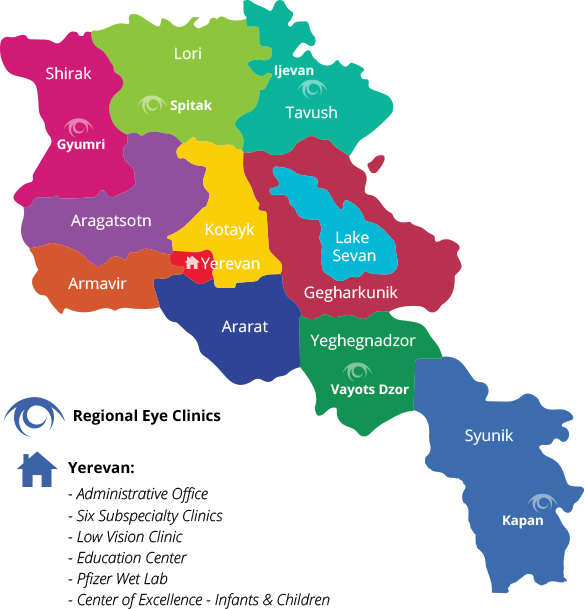 Just four towns outside of Yerevan provide basic eye care and most surgery is available only in the capital. Few Armenians are able to travel the distance because of cost or other reasons and they go without care, leaving many visually disabled. Armenians have learned to accept blindness as a part of growing older because they have no access to eye care. In the United States people accept cataract surgery as a part of aging and it is a common procedure. In Armenia just one out of four who need cataract surgery have access to care. And the situation is about to become much worse as the population begins to age and life expectancy increases. Today 91,000 Armenians or 30 percent of the population, age 65 and over, have cataracts in one or both eyes, causing partial or complete blindness. By 2050, in a little more than 30 years, that number will more than double. The “Five for Five” Regional Eye Clinics will provide access to eye care that is very badly needed and bring sight to Armenian eyes. Ijevan. The “Haig John Boyadjian Regional Eye Clinic” in Ijevan, the capital of the Tavush Province in the northern part of Armenia, has been underwritten by Haig Boyadjian through his bequest to the EyeCare Project. According to tradition, King Artavasdes I built a city at Ijevan about 2,000 years ago. He gathered only the beautiful girls and the handsome boys from all over Armenia, so that later they would get married and settle in the newly established town. Gyumri. We are thrilled to announce our second Regional Eye Clinic — the “Hasmik and John Mgrdichian Regional Eye Clinic in Gyumri, the second largest city in Armenia and the capital of the Shirak Province in the northwestern part of the country. The first settlement at the location of modern-day Gyumri was founded in 401 BC, by Greek colonists. Kapan. Kapan is the seventh largest city in Armenia and the capital of the Syunik Province in the southeast part of country. Kapan is the most populous town in Syunik and the entire region of southern Armenia. The word Kapan originates from the Armenian verb kapel, meaning “to lock,” and points to an old Armenian geographic term for valleys surrounded by interlocked mountain chains. Yeghegnadzor is the capital of the Vayots Dzor Province in the southern part of the country. It is one of the ancient settlements of the Vayots Dzor canton within the historic province of Syunik. Vanadzor is the third largest city in Armenia and the capital of the Lori Province in the northern part of the country. The area of Vanadzor has been settled since the Bronze Age, based on the tombs and other historic remains found on the nearby hills of Tagavoranist and Mashtots. There are a number of naming opportunities for our donors to the “Five for Five” program. We will name rooms — operating, reception — after you or someone you want to honor. And there will be a Donor Wall in each clinic where all donors to “Five for Five” will be listed. We are also acknowledging all donors in the printed program for our Annual Gala on November 22, at the Balboa Bay Club. The Armenian EyeCare Project is enormously grateful to its donors. The organization is entirely dependent on donations for its eye care programs and the highest percentage possible goes directly to Armenia for eye care. With the organization’s largest project underway — five Regional Eye Clinics — contributions are needed now more than ever. Always believing in the vital importance of vision and eye care, Haig Boyadjian, a long-time resident of New Jersey, was born in Jerusalem, the Mandate of Palestine. To celebrate Haig’s life, the Armenian EyeCare Project will name its first Regional Eye Clinic, located in Ijevan, Tavush, opening in July, in his honor — the Haig Boyadjian Regional Eye Clinic. The Eye Clinic will bring accessible, quality eye care to the people of Tavush. The EyeCare Project’s clinic in Syunik has been underwritten by the Mgrdichian Foundation — the John and Hasmik Mgrdichian Regional Eye Clinic. Berg Kayaian has named the operating room in the Yeghegnadzor Clinic in honor of his mother, Araxie Apigian. With lots of naming opportunities still available the Project is reaching out to donors for clinics in Shirak, Syunik and Vayots Dzor. There will be a donor wall in each clinic and donors will be heralded at the Project’s Annual Galas.